Andrea Hill has literally written the book on hiring for small business owners, and she brings her 30 years of corporate hiring successes, failures, and lessons to you in this presentation. 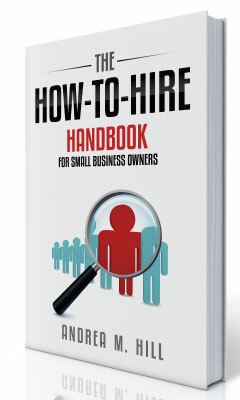 Part ‘how-to-hire’ instruction, part stories-to-learn-from, and all entertainment. This talk will energize the audience to approach hiring in a whole new way, and will empower them to create the powerhouse team their business needs and deserves.